What: Invention of the 3rd type of resonator guitar. Single cone resonator with a "spider bridge". Worked with: John Dopyera. Rudy's name was on the patent for the invention but his brother John was the true inventor for this and likely all variations of resonator guitars. When we last left our heros, the inventors of the resonator guitars, George Beauchamp had patented the single cone, biscuit bridge resonator guitar. 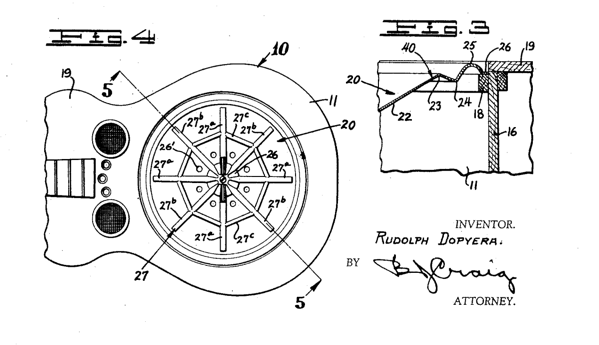 It is likely that John Dopyera was the true inventor and that George Beauchamp patented a discarded design of John Dopyera’s. John had secretly been working on a new design for a single cone resonator guitar. The relations betweeen John and George were not good. John resigned from the National Guitar company and with his brother formed the Dobro company (DOpyera BROthers). His patents were assigned to National. But he had the design for the spider bridge single cone resonator guitar. It was patented in brother Rudy’s name to protect it from claims that it was owned by National. The new design was different from the biscuit bridge desgin because the aluminum cone faced out instead of in and because the 8 legged spider bridge sat near the edges of the cone instead of on the apex as the biscuit bridge did. When John invented the tricone guitar he thought it was a great achievment – a louder guitar with a sweet even tone. But he thought the spider bridge resonator guitar was even better because it achieved a similar tone in a simpler design. The single cone resonator guitar as first built by Dobro has become associated with Bluegrass music and musicians such as Jerry Douglas. But blues musicians also perform with it. Eric Clapton used this type of guitar on some of his acoustic blues recordings. The history of National, Dobro, the Dopyera brothers and George Beauchamp and their influence on guitar designs isn’t done. The National / Dobro story continued to be somewhat like a soap opera. And all parties continued with some innovative guitar designs.